Rhodesian Ridgebacks, as a breed, are fairly healthy. However, the following health problems are considered more prevalent and therefore, should be considered before deciding to get a Ridgeback as a pet. Dermoid Sinus: A congenital defect that is usually identified at or close to birth. DS is a neural tube defect; a small "tube" of tissue does not close properly during fetal development. Dermoids are almost always found along the spinal chord and sometimes at the base of the tail. On the surface of the skin a tiny opening usually exists, which can be a source of infection for the dog. It is recom-mended that dermoids be removed by an experienced veterinarian prior to placement in a new home. Thyroid Disease: Testing for abnormal thyroid function involves a fairly expensive blood test. Ridgebacks can have abnormal thyroid panels, which can be a precursor to thyroid disease. All breeding stock should be tested using the full MSU panel and be certified normal by the Orthopedic Foundation for Animals before used in a breeding program. Hip/Elbow Dysplasia: Dysplasia is defined as the abnormal growth or development of cells. In dogs dysplasia usually refers to the malformation of a joint that can become painful and debilitating. While Ridgebacks in general do not have great incidences of hip or elbow dysplasia, it is important that all breeding stock be tested and cleared, so that these problems don't crop up in future generations. Dogs are diagnosed using radiographs and results can be verified by the Orthopedic Foundation for Animals or PennHip. Other options may be available in countries outside the U.S.
Reputable breeders want to produce the healthiest puppies possible. Genetic screening for diseases is not cheap - but it is an investment we have to make. 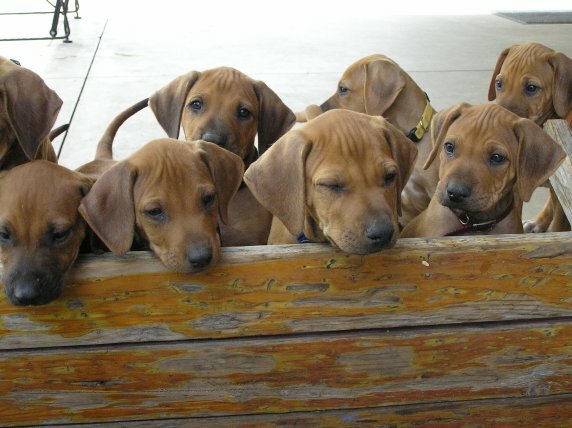 Rhodesian Ridgeback breeders in particular, have been extremely proactive in preventing many serious diseases from becoming common-place, and have one of the highest participation rates in canine genetic disease research studies. Degenerative Myelopathy: A debilitating disease that usually presents in the older dog. Dogs with DM will gradually lose control of their rear legs, resulting in paralysis and possibly incontinence. DM is not painful to the dog and there is no cure. To our knowledge, this disease is not widespread in Rhodesian Ridgebacks, however, a new, simple DNA test has been recently developed, which can identify carriers - an important factor when planning breedings. Eye Abnormalities: Once again, Ridgebacks do not have a high incidence of eye problems, which can consist of cataracts, entropion, glaucoma, corneal abnormalities, etc. All breeding dogs should by declared normal via a recent CERF (Canine Eye Research Foundation) exam by a veterinary opthamalogist before breeding. Megasophagus: A congenital malformation of the esophagus that causes food to be pooled there, instead of going on to the stomach. This causes regurgitation of food and malnutrition of the puppy. Megasophagus puppies can usually be identified early on and are normally euthanized. New research has indicated that littermates of megasophagus puppies may also be mildly affected and could be carriers of the disease. Research into this abnormality is ongoing . . .